Hydroflight sports is a category of sport in which water jet propulsion is used to create sustained flight where lift and movement are controlled by a person riding on a propulsion device. The three most common devices are jetboards, jetpacks and jetbikes. 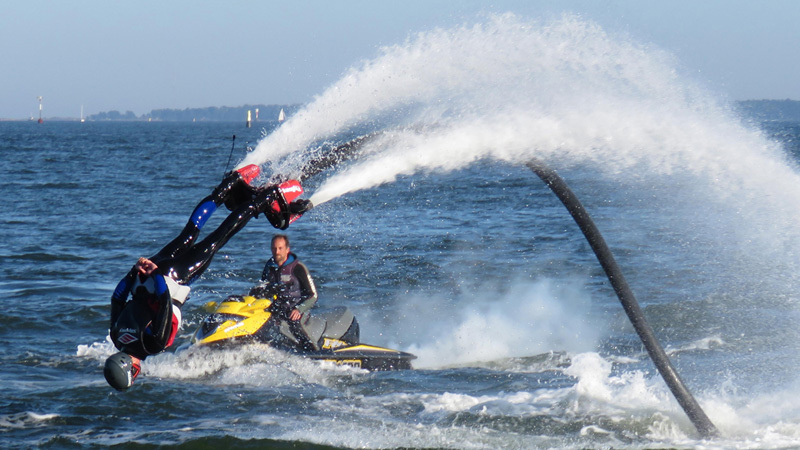 JetLev's jetpack was the very first hydroflight device. Hydroflight sports devices are available to all consumers and offer fun moments and experiences for first timers, but also challenges for pro riders. It is recommended that first timers get to know the sports and its devices with an experienced operator before purchasing their own equipment. Beginners always ride with the operator / coach that sits on the pwc and presses the throttle, but advanced riders can use a remote control to adjust pwc's rpms to desired levels. Pro-level competitions started around 2012, when French manufacturer Zapata Racing started their own series of closed jetboard world cups. Year 2016 was revolutionary for hydroflight sports competitions: several other manufacturers and providers (e.g. Jetpack America, Defy, X-Jets among others) started arranging open competitions and events for all brands and devices. Reel of the most advanced jetboard tricks. Competitions are based on tricks that are usually rated by panel of 5 to 6 judges. Judges evaluate riders' trick quality and technicity, variety, overall energy and show elements. Knockout battle is the most common hydroflight competition format. As in many other water action sports floating vest is mandatory safety equipment in hydroflight too. It is also recommended to use helmet (with ear protection) in every level of riding. Hydroflight is considered as a realtively safe sports for beginners, yet most of the operators use waivers that the client needs to approve before stepping on a jetboard or other hydroflight device. Most of the injuries happen when rider performs advanced moves / tricks on full throttle. Dives are also risky when operating in too shallow waters - recommended depth of water for pro level jetboarding is +4 meters / +13 ft.
Hydroflight sports .com is an independent website dedicated to the sports itself. Hydroflight sports .com offers info about devices, tips for beginners and links to other hydroflight sports related websites.